← Day 7 – Who is the Turkey at Bedtime? Sometimes the dogs are just plain odd. Tuulen has this thing about shoes. Maybe he feels a need to make up for my lack of interest in footwear, but whatever his strange motivation, his behaviour is pretty consistent and certainly strange. If I am working at the computer and not spending enough time looking at him lovingly, he will go out to the mudroom and carefully select the shoe I have most recently worn. Very gently he pulls it off the rack and brings it back into the bedroom and places it on the bed beside him. Sometimes, he then proceeds to poke his long, dexterous snout into the shoe so he can extricate the insole. There is no chewing involved in all this (thank goodness, or I’d be farming barefoot! ), more like a thoughtful meditation on what humans wrap around their feet. 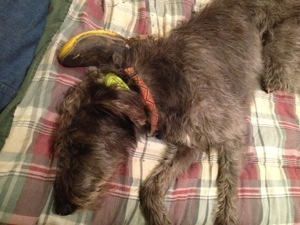 After he has placed the shoe or boot or slipper just so in the bed, then he lies on it and sighs. And that’s it! End of game! There’s no licking or tossing or playing ‘look what I have! Can’t catch me!’ He just lies on the shoe until it gets uncomfortable or he gets bored or I still refuse to pay any attention to him and then he gets up and repeats the whole ritual. Sometimes by the end of a session at my desk there is quite a collection of footwear on the bed. Socks are occasionally added and, very rarely, other random objects. Yesterday, he found an old soup ladle I had placed by the back door ready to start a new life down in the feed room at the barn. This precious object he placed across my pillow before lying on it and sighing. I can tell you I was less than thrilled to see that muddy boot on my bed! I had just come up from the barn where I’d slopped around the wet area by the hog water and those boots were disgusting! It’s not nearly so bad when he plays this game with my slippers. So, I ask you – what the heck is that all about? Interested in learning who else is participating in the 30 days agriculture blog-a-thon or the five things Holly Spangler will be talking about this month? Head over to Prairie Farmer to find out! This entry was posted in Blog, Dogs, Uncategorized and tagged 30 Day Farm Blog challenge, Dark Creek Farm, dog behavior, whippet poodle cross. Bookmark the permalink. He is devoted – try a small teddy bear in the pocket that you then leave in the mud room. Wont be so messy and he may find more comfort. Just my 2cents. 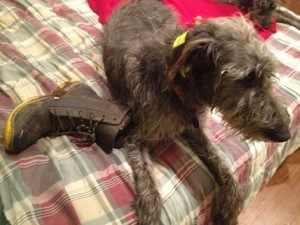 I sure wouldn’t like to find my muddy boots on the bed either, but it seems to me that this is a way of showing love. The boots remind Tuulen of you and he just wants to have a reminder nearby at all times. Awww. Very heartwarming. I have to say, he is a particularly snuggly dog who wishes he were a couple of sizes smaller so he could crawl into my lap while I’m at my computer. Muddy boots seem a poor substitute to me… I like Cathy T’s idea of putting a small stuffed animal or something in my pocket and then leaving that on the mudroom shelf for him to ‘find’ and take to bed.